Moominhouse is a fictional house, where the Moomins live in the tales by Finnish author Tove Jansson. 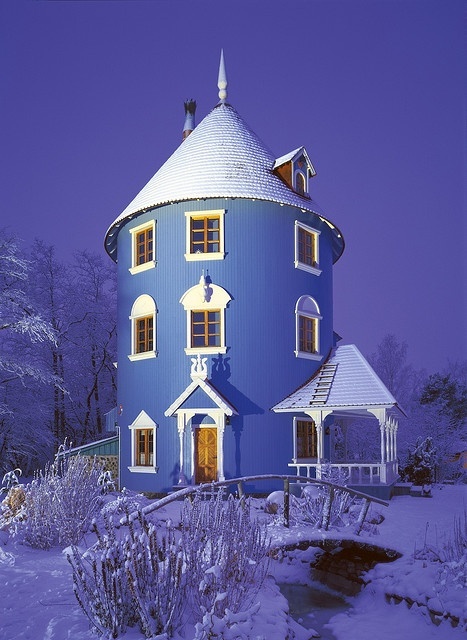 Its tall, round shape is said to be patterned after the porcelain stoves behind which the Moomins' ancestors used to live. The house is described and depicted in many of the books and comics about the Moomins and Tove Jansson even drew blueprints of it as an illustration for Finn Family Moomintroll. When she built a model of the house in the 1970s, it was however not made round; this 2.5 metres tall model is now on display in the Moomin Museum in Tampere. She once explained the difference as that "it wasn't easy to know what the house looked like before it was built", a typical example of her humour. The full size moominhouse built in 1993 at the theme park Moomin World in Naantali was however created looking more like Jansson's own earlier drawings of the house, while the moominhouse in Akebono Kodomo mori park in Hannō in Japan again is quite different.